If you read my blog yesterday this is the follow on to it. NASA held a media teleconference today in which I participated to discuss the status of the long awaited James Webb Space Telescope (JWST) https://www.nasa.gov/mission_pages/webb/main/index.html which had been slated for a launch in 2018 and then 2019 https://wtop.com/the-space-place/2016/11/james-webb-space-telescope-2-years-expected-launch/slide/1/ . It was announced today that NASA has now tentatively scheduled launch for May 2020. 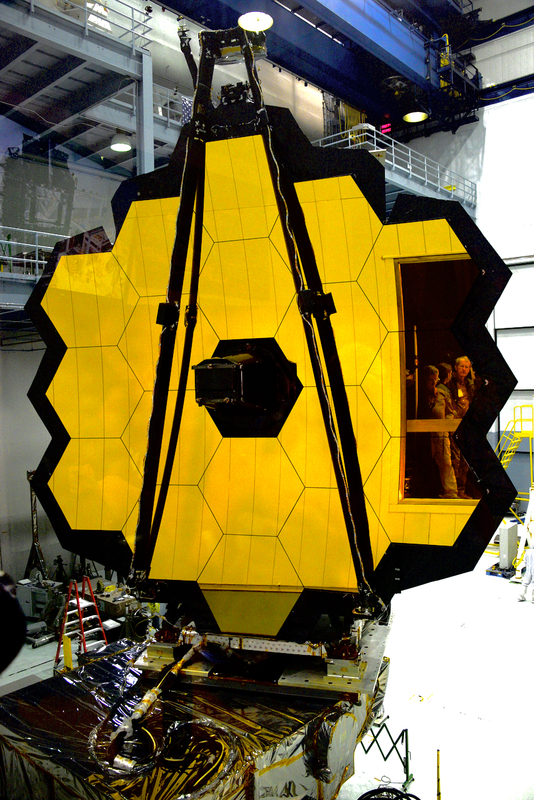 JWST consists of two separate elements - the Optical Telescope Element (OTE) and the spacecraft element which the OTE is attached to. The OTE consists of the 6.5-meter telescope and its instruments. Over the years it was built, assembled and tested at NASA Goddard Space Flight Center, Greenbelt, Maryland before being completed last year. The OTE then underwent months of additional successful testing at NASA’s Johnson Space Flight Center, Houston, Texas. In early 2018 the OTE was flown by a C-5 aircraft to California for integration and testing with the spacecraft element. The spacecraft that the OTE will be integrated with was built by primary contractor Northrop Grumman. It consists of a five layer sunshield the size of a tennis court to protect the OTE from heat of the Sun, Moon and Earth. The spacecraft also carries solar panels and batteries for power, radio communications and propulsion systems and the avionics/onboard computer system. The spacecraft will fly the OTE out to a gravitational point called L-2 one million miles from Earth where the telescope will operate just 40 degrees above Absolute Zero. For the first time in the project’s history both elements are at the same facility in Redondo Beach, California for integration and testing. It was during the testing of the spacecraft element that several technical issues arose. NASA said in a press release today https://www.nasa.gov/press-release/nasa-s-webb-observatory-requires-more-time-for-testing-and-evaluation-new-launch that,“Testing the hardware on the observatory’s telescope element and spacecraft element demonstrate that these systems individually meet their requirements. However, recent findings from the project’s Standing Review Board (SRB) indicate more time is needed to test and integrate these components together and then perform environmental testing at Northrop Grumman Aerospace Systems in Redondo Beach, California, the project’s observatory contractor. Because JWST, consisting of both integrated elements, has to be folded up in order to fit into the payload fairing of the European Space Agency’s (ESA) Ariane-5 rocket, a complex deployment sequence has to take place in the proper order. Part of this sequence is the unfolding of the large sunshield. During testing of the sunshield’s folding process and subsequent deployment sequence it was found that tears developed and the sunshield’s tensioning cables had to be redesigned as the original design left too much slack. Additionally there were problems that developed with the spacecraft’s propulsion system, specifically thruster valve propellant leaks. A technical issue with transducers developed as well. The discovery and fixing of these issues, the ongoing complex integration of the two JWST elements, plus the time needed for rigorous and thorough testing of the completed integration all led to the slipping of the launch date. JWST “mission success” will be a 10 year cycle of observations revealing what we have never seen in the Universe before - the first stars and galaxies forming, new discoveries in our own solar system and other planetary systems and most tantalizing, things we have not even imagined. I will provide updates on JWST as they develop.